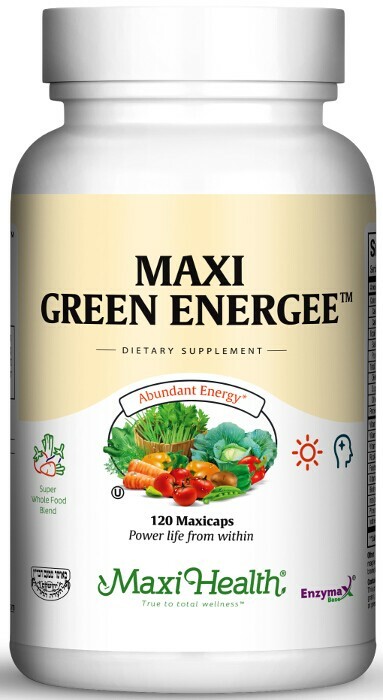 The Super Green Foods contained in Maxi Green Energee™ capsules are nutritious whole food supplements derived from green plants, cereal grasses, and micro algae. They contain high concentrations of chlorophyll and are loaded with natural vitamins, minerals, amino acids and enzymes. Green food concentrates are real food, safe and natural. They are known as super foods because they are nutrient dense when compared to other foods. Maxi Green Energee™ capsules includes cereal grasses such as wheat grass, barley grass, and alfalfa. All of which are organically grown without herbicides or pesticides in rich soil. We use cereal grasses which are planted in the fall and grown through the winter. They are nutritionally superior because these grasses grow slowly and develop naturally in an ideal climate. Try gluten free Maxi Green Energee™ capsules today. Take four (4) capsules, twice daily in juice or water, or as directed.